An RAF chef who collapsed and died from a sudden brain haemorrhage while on duty in the Falklands was due to receive a medal from the Queen. Warrant Officer Ian Goddard, 52, of Greylees, was only six days away from returning home from a four-month detachment to The Falkland Islands when the tragedy happened. It was during an annual event where the senior ranks in the catering section (known as the Top Cats) serve the lower ranks (known as The Kittens). Wife Louise, 50, said: “It was very sudden. He just took poorly and died. A father and grandfather, he leaves children Sian, Katherine and Alex, son-in-law Darren and grandchildren Nicole and Hollie. They have lived in the Sleaford area for 15 years, while Ian continued to travel with the military. Joining up in 1983, he was two-and-a-half years off retirement. Louise, who works for the civilian catering company ISS at RAF Coningsby, where her husband was also usually based, said: “We have found out Ian was on the Queen’s birthday honours list to get the Meritorious Service Medal and my middle daughter was chuffed to find out that her and Ian’s hero, Alan Shearer was also on the list, as they were both massive Newcastle United fans. Louise said Ian loved to keep fit and did a lot of sport, becoming a fitness instructor for his catering section and doing a course in spinning. She said: “He was always involved in something, doing charity work with the RAF. While away in the Falklands he completed a 62-mile walk for the local hospice and Cancer Research UK. 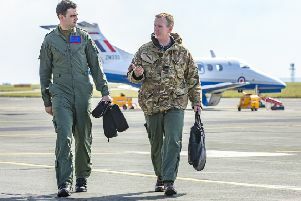 He had been Warrant Officer at the RAF School of Catering at Worthy Down before taking up his latest post at Coningsby in December, overseeing the civilian catering contractors at several local bases. His funeral service took place on Monday at St Denys’ Church, Sleaford, followed by private cremation at Lincoln, before a celebration of his life at the Sergeant and Warrant Officers’ Mess at Coningsby. Donations were invited for RAFA and BLESMA, for which Ian had done quite a lot of charity work.